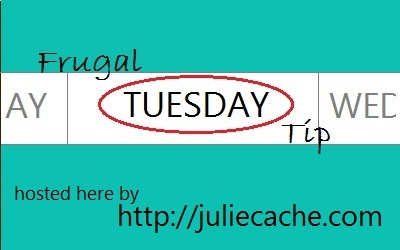 Welcome to the Frugal Tuesday Tip! I love seeing people join our linky. Frugality can be applied to many different areas of our lives, and that shows in your posts. Share this linky with your friends. They’ll appreciate all the tips. Our linky closes Friday night. If you don’t know what a permalink is, you’ll find instructions near the bottom of my Frugal Living page. Be sure to share the love and let all your readers know that you’ve joined us with this button! And while you’re blog hopping, you may want to see Alea and her cohorts in the Hearth and Soul Blog Hop every Monday. This entry was posted in frugal family. Bookmark the permalink. You guys have such great frugal tips! I love you and hope you link again next week.